Hellard, in car on right, speaks with the Cougars players. There was a touching moment at the end of the Welsh Premier League semi-final between Valley Cougars and Rhondda Outlaws on Saturday in Treharris, which the Cougars won 64-20. As has been well documented, the Cougars player-coach Dafydd Hellard has testicular cancer, and after a tough few days spent in hospital last week, he was under strict instructions by the doctors not to leave the house or come in contact with anyone, due to his white blood count being so low that had neutropenia and could catch infections. However he couldn’t miss the Cougars match so he drove to the ground, stayed in the car and ensured he had a good view of the game. 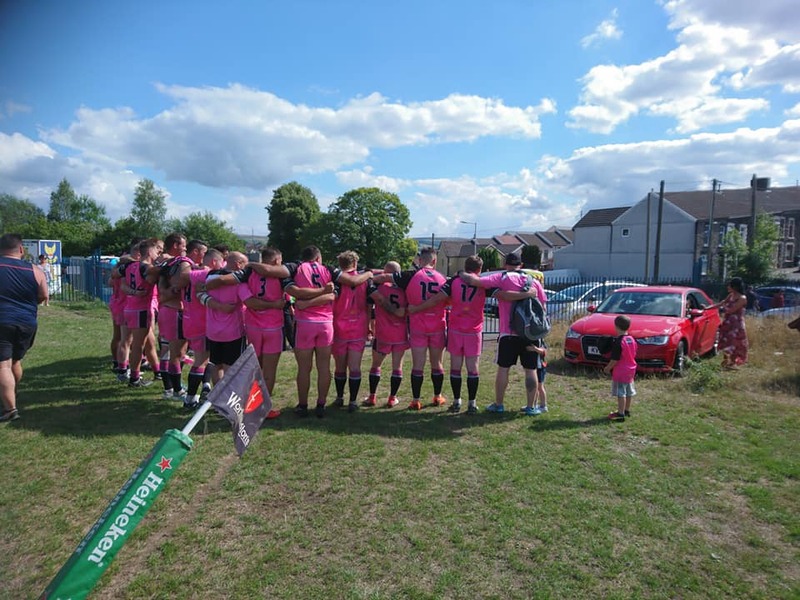 After a win like the Cougars experienced, Hellard would normally be in the team huddle so instead of missing out, the players, led by skipper Scott Britton came over to him in his car, for him to still have his say. “I couldn’t be more prouder of these bunch of lads and this team,” Hellard commented. The Rhondda Outlaws side brought along a donation from their players to go towards Hellard’s medical bills to complement the fundraising work already done by the Cougars. Mike Hurley scored a hat-trick of tries and kicked eight goals for the Cougars with Ryan Davies, Shane Lee and Adam Watton each going over twice. Ethan Coombes, Lee Goddard and Ben Jones completed the try scoring. Despite the high scoreline, the Outlaws never gave up throughout the game and they scored two tries in each half. Max Hendy and Mike Herbert going over before the break, both unconverted, with Morgan Cross and Sion Griffiths scoring in the second half and Chris Harris converting twice. Torfaen edged into the Grand Final after eventually seeing off the efforts of a plucky Cardiff side. Josh Palmer gave Cardiff an early 4-0 lead but a Matt Williams try levelled things for Torfaen with Dai Thomas’ conversion taking them ahead. Further Torfaen tries, from Brett Thomas and Jarred Hinnem, the first of which was converted by Dai Thomas, gave Torfaen a 16-4 lead at the break. The two sides exchanged unconverted tries early in the second half, Duane Iles for Cardiff, then Andrew Barlow for Torfaen, before the Blue Dragons turned the semi-final into a classic. First Palmer went over for his second, then Morgan Cochran, with Cochran converting both, and the scores were level. However three tries from Torfaen in the last 20 minutes sealed things. Geoff Hick was first over with Hinnem and Brett Thomas each nabbing their second with Dai Thomas adding one further conversion.